What is MAKOplasty for Knee or Hip Pain? MAKOplasty® partial knee resurfacing is a minimally invasive procedure for those suffering with painful early to mid-stage osteoarthritis of the knee. 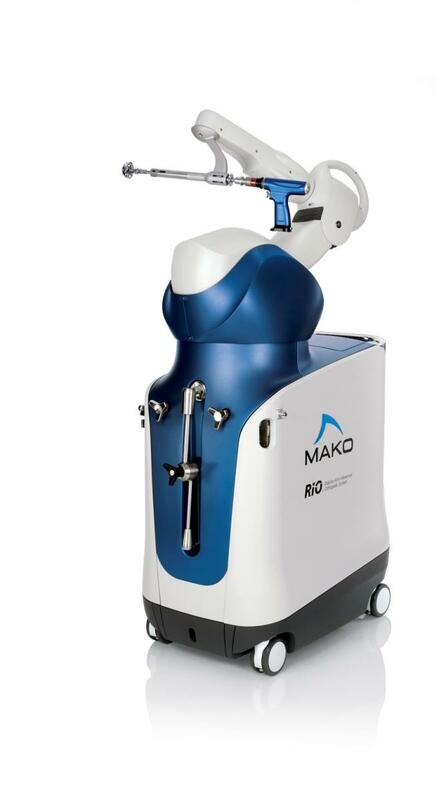 It is performed using the surgeon-controlled RIO® robotic arm system and offers more accurate resurfacing of the diseased portion of the knee, saving as much of the original as possible. MAKOplasty® total hip replacement is a procedure that combines the expertise of an Orthopedic surgeon with the RIO® system for accurate placement of the hip implant based on your unique anatomy. Suffering from knee or hip pain can take you away from the activities you love. Symptoms usually include pain while standing or walking short distances, pain or stiffness when standing up from a sitting position, difficulty climbing up or down stairs, swelling or a grinding sensation. Most often, knee and hip pain is due to early to late stage osteoarthritis, and is usually treated with physical therapy, injections or pain-relieving medications. MAKOplasty is designed to relieve these painful symptoms through a precision-controlled, surgical procedure. To determine if you are a good candidate for MAKOplasty, a review of your medical history and symptoms, plus observation of the natural movement of your knee, reflexes, muscle strength and range of motion. For the hip, more extensive diagnostics are required. Our orthopedic surgeons will then determine if a MAKOplasty procedure is right for you. There's no reason to continue to suffer when help is now available! Patients usually walk soon after surgery, drive a car within two weeks and then return to normal activities!